Firefighters are unsung heroes who work for the safety of the population by dealing with fire hazards all over the country. These firemen also need some time to relax from their hectic schedule of training and firefighting. Despite being tough both mentally and physically, they also wish to be loved and pampered by family and friends, like all others. The best way to make someone know that you value his/her presence in your life is through an awesome gift. Gifts are one of the best and oldest ways to demonstrate affection, gratitude, and delight on one’s success. It doesn’t even have to be an expensive and extravagant gift, something as small as a teddy bear or a rose can do wonders for your relationship with the other person. To make your task more accessible, we have prepared a list of fantastic gift ideas for your closed ones who put their lives on the line for the sake of others. Below are some unique firefighter gifts for various purposes that can make the brave hearts happy. Have a look! The first occasion on our list is possibly the most significant and proudest moment in a firefighter’s professional life; the day when all the hard work and dedication come together to paint a picture of a bright future full of heroic feats. The graduation day, as most of you will understand, denotes that the training is done and the fireman is now ready to fill the shoes of a professional. In a way, they start a new chapter of their lives. How about you give them something which will make this day even more memorable? Listed below are some of the fantastic graduation gifts for new firefighters. This double-walled, 20oz travel mug is a multi-purpose tool which makes for an amazing gift for all purposes. It is available in multiple shades, and its scratch-free exterior makes using it all the more hassle-free. 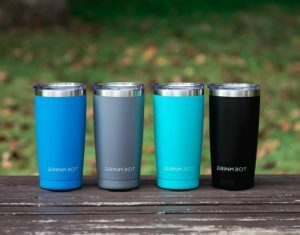 It is designed to fit in most cup holders and keeps the drinks cold for about 24 hours and hot for almost 6 hours. This oak stained beauty will make a perfect graduation gift for a firefighter. The firefighter’s prayer has been engraved on the top of the box along with the fire department logo. The box is eight inches square and about 1.75 inches tall and is made for keeping lightweight trinkets and treasures like photographs, pendants, rings, etc. For those loved ones who like to keep their brews in hand at all times, this will make an excellent fireman gift. This 64oz beer growler comes with a Maltese cross printed in the front, and each glass is engraved personally for the buyer. The growler is glass made and is four inches tall and two inches wide. It is easy for carrying that pint around. Women are a testament of strong will and bravery. In these times, there are no professions which remain un-penetrated by them, and firefighting is no different. If you have gone and gotten yourself a hero for a girlfriend or a wife, then my dear friend we have some gifts that will blow their minds. Well, while they are strong and self-dependent, let us not forget that they are women and they will always love jewelry. So, for that amazing female in your life who has just graduated as a firefighter, this bracelet will make the right gift. This heart-shaped bracelet is made of an alloy with a diameter of about 2.5 to 3.3 inches. The product comes in silver and rose gold color options. To show them just how proud you are of them and all they do for others, how about this gorgeous silver plated key ring with “My Hero Wears Red” charm engraved on it? It is the best gift to let them know how much you appreciate and love them. 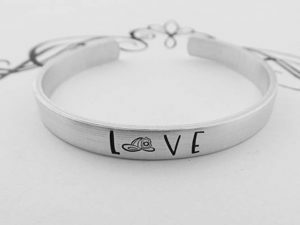 This hand stamped ‘Love’ bracelet will infatuate your girlfriend or wife upon first look. The letters are stamped on a half inch wide and six inches long band of aluminum. It is highly flexible and incredibly durable as well, which promotes extended wearing. My dad is a superhero.” This is a statement we have all said at one time or another in during our childhood days. Some fathers are not just superheroes for their families but other families as well. So, if your father is, in fact, a superhero, i.e., if he is a firefighter and runs into buildings cloaked with fire and save people, then we have got some great gift ideas for them. This 24oz BPA water bottle with thin red line design will make a unique for firefighter dads. It is durable and holds water efficiently in a leak-free manner. On top of all that, it is incredibly stylish too. These can coolers are a fantastic gift for those dads who enjoy beers or sodas. Made of open-cell polyurethane foam, these can coolers keep your beer and soda cans chilled. At the same time, they also prevent your hands from getting frostbite. The best part about them is that they come in thin red line printing as well which makes them a suitable gift for firefighter dads. This thoughtful and useful gift will put an instant smile on your hero’s face. It gives them a chance to drop some swag and show just how proud they are of their jobs. These 11oz mugs are manufactured with high-quality ceramic, and the printing is top-notch. So, you’re the proud girlfriend of a firefighter, eh? Well, everyone loves a strong, brave man with a noble heart. But these strong men are very hard to shop for though, aren’t they? So, here are some cool firefighter gift suggestions for your love. This sweet and slightly flirtatious gift from you will put an instant smile on your boyfriend’s face. Let him know how much he means to you and how proud you are of him. This novelty keychain is light-weight and also comes with a charm which reads “Be safe <3 yah” and a non-corrosive fire extinguisher. Most men love whiskey, and if your boyfriend is among them, then why not gift him this bullet whiskey set. It comes with six bullet stones which can be frozen and then dropped in drinks to cool them with the fear of the drink getting diluted as is the case with ice which melts slowly. Along with the bullets, the set also two twisted glasses and a pair of tongs. If you want to gift your boyfriend something unique, then this pocket watch set is just the gift you’ve been looking for. This gorgeous pocket watch is comfortable to wear and can be very quickly put around the neck with the chains that you will find in the box. How about you put a little personal touch to your gifts? Firefighters are special people, so it is only fair that they should get extraordinary gifts which have been made just for them. Below is a list of such personalized gifts. This natural burlap print comes with a thin red line USA flag print with the name of the person printed right below it. It is a great personalized gift for firefighters and is entirely customizable as well. Instead of the name of the person, you can have anything you want to be printed below the red line print. This beer mug is made of sturdy glass and has a heavy base. On the front, any name and year can be printed, that makes it highly customizable. It is a gift for those who like to consume their brews in style. 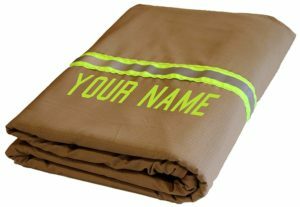 Another amazing personalized and useful firefighter gift is this firefighter station blanket. Crafted with 100% cotton ripstop, the quilt is sixty inches wide and eighty inches long. Instead of being stitched, the names are thermally bonded with the material to make them last longer. Thinking of congratulating them on their recent promotion, or want to let know them that they were awesome before and now they have just taken it up a notch? Then, we have got some gift ideas for you. This travel mug is an excellent gift for men or women who have just been promoted. It holds about 14oz liquid and fits into standard cup holders very easily. The lid is shatter-proof and dishwasher friendly, and the thick double wall keeps the liquid hot and cold longer than usual. 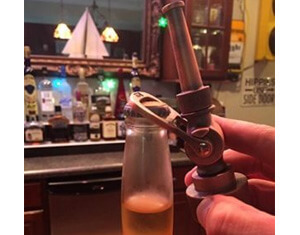 For those who like to drink, this two in one bottle opener is a useful present. The product is available in three colors and is powder-coated for a durable finish. It is six inches long and weighs seven ounces. This table top is made of high-quality resin polymer stone material and has the dimensions of 6*5*4 inches. It weighs four ounces and has “Joyful Hope” engraved at the base. This tabletop is a heartwarming present for those who are about to embark on a new journey. What do you gift a man who’s mastered the professional life and is about to leave it behind, for good? It is a tough question, but we have tried to answer it with a few retirement gifts for firefighters. This hand blown glass decanter is shaped like a globe and has an intricately printed Maltese cross in the front. It is a royal gift for an old-timer who enjoys liquor. It is 100% lead-free, and stores about 1000ml of alcohol at a time. This bottle opener has a certain old-world charm to it and is thus the best present for those old souls who still like to reminisce about the good old days. This easy to use opener weighs just ten ounces and is six inches long. 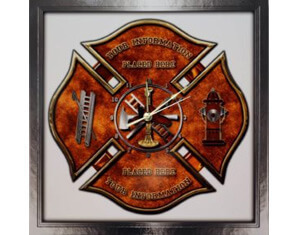 This highly customizable wall clock is a great souvenir for a retraining firefighter of his service. The clock is made of scratch-free aluminum, and the printing on the clock face is done by heating a gloss material on it. We hope that you must have found these gift ideas for firefighters useful. Now, do not waste any time and surprise your loved ones with their favorite gifts. Let them know how important these heroes are for you.